I'm thrilled to host this week's Nonfiction Monday roundup! You can find awesome posts and reviews of nonfiction titles below my review of Brave Girl. Have a post to add to the roundup? Please leave a link in comments and I'll add posts throughout the day (I'm going to be in meetings today, but I'll start adding posts this afternoon, so thanks for bearing with me!). 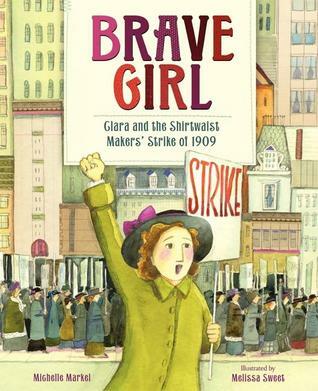 Brave Girl: Clara and the Shirtwaist Makers' Strike of 1909 by Michelle Markel, illustrated by Melissa Sweet. Grades 2-5. Balzer + Bray, January 2013. Unpaged. Review copy provided by my local library. When Clara Lemlich immigrated to the United States, she was hoping her family would find a better life there. But in the early 1900s, life was hard for immigrant families. Clara's father was unable to find work, so Clara got a job as a garment worker. Conditions were terrible. Clara was expected to work long hours with few breaks. If she was a few minutes late, she would be docked half a day's pay. Workers were locked in during the day and 300 girls had to share two filthy toilets. Clara knew something had to change and she began organizing strikes and picket lines. Men didn't think ladies were tough enough to walk the picket line, but even though she was arrested 17 times (! ), Clara didn't give up until factory owners granted better working conditions! This is a fabulous book for talking about women's history and activism or for exploring the lives of immigrants or child workers at the turn of the century. Clara's story is an inspiring one, but instead of a straight biography we here have a succinct and accessible introduction to the issues facing workers at the turn of the century. Clara joins a Union and speaks up for a general strike when the smaller strikes don't result in change. And through it all is the underlying message that girls can do anything. Melissa Sweet's mixed-media illustrations make a perfect partner for the text. She incorporates many textiles into the paintings, often very subtly, using bits of ribbon or fabric to create background buildings or pieces of clothing the people are wearing. She uses stitching as frames and embellishments throughout. This is Melissa Sweet doing what Melissa Sweet does best - incorporating materials that directly relate to the subject matter and add interest to watercolor paintings. It reminds me of the work she did on her Caldecott-honor-winning A River of Words. And the strike convinced Clara to keep fighting for the rights of workers. Her throat is hoarse, her feet are sore, but she has helped thousands of people. Brave Girl is on shelves now! Don't miss it! Laura Salas shares a piece of art from her forthcoming book Water Can Be... (Milbrook Press, 2014) and discusses some activities to use with her book A Leaf Can Be. At Hope is the Word: a review of The Extraordinary Mark Twain (According to Susy) by Barbara Kerley. Roberta of Wrapped in Foil snuggled up with Shep: Our Most Loyal Dog by Sneed B. Collard III. Tara of A Teaching Life posted about what she's been reading lately, which includes nonfiction books The Price of Freedom: How One Town Stood Up to Slavery and Emancipation Proclamation: Lincoln and the Dawn of Liberty. Jennifer of Jean Little Library is ignoring the weather outside and reviewing Grow It, Cook It: Simple Gardening Projects and Delicious Recipes. Alex of The Children's War posts about His Name Was Raoul Wallenburg: Courage, Rescue, and Mystery During WWII by Louise Borden. Cindy and Lynn of Bookends "race" to add to Nonfiction Monday with a review of Queen of the Track: Alice Coachman, Olympic High Jump Champion by Heather Lang. Jeff of NC Teacher Stuff is treating us to a review of Dessert Designer: Creations You Can Make and Eat! by Dara Meachen Rau. Jennie of Bibliophile joins us with a review of The Amazing Harry Kellar: Great American Magician by Gail Jarrow. Jeanna of True Tales & A Cherry on Top is featuring Colorful Dreamer: The Story of Artist Henri Matisse by Marjorie Blain Parker. Margo of The Fourth Musketeer posts about War Dogs: Churchill and Rufus by Kathryn Selbert, a book about Winston Churchill and his poodle! Alicia of The LibrariYAn gives us a review of Rescuing the Children: The Story of the Kindertransport by Deborah Hodge. Andromeda of A Wrung Sponge reviews What Color is My World? : The Lost History of African-American Inventors by Kareem Abdul-Jabar and Raymond Obstfeld. Anastasia Suen of Booktalking shares her new book Online Privacy and the Law. Janet of All About the Books posts about Digging for Troy: From Homer to Hisarlik by Jill Rubalcaba and Eric H. Cline. Sondra of Sonder Books reviews I Have a Dream by Martin Luther King, Jr., illustrated by Kadir Nelson. Have another post to add to the roundup? Leave the link in comments, please!